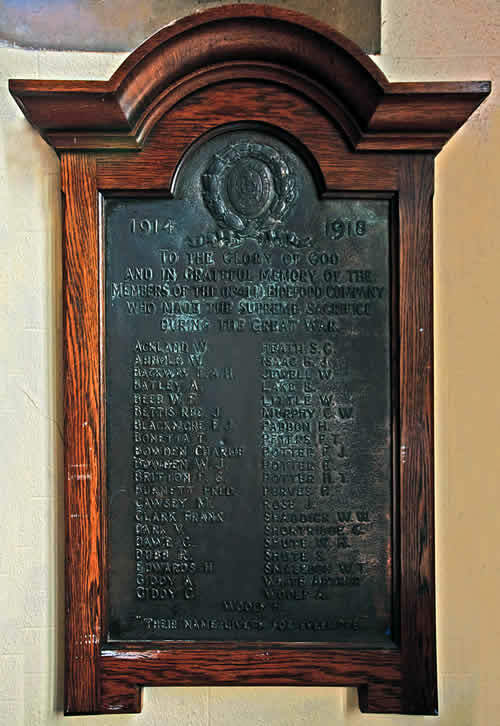 This memorial plaque in St Mary's Church, Bideford, gives an excellent idea of the scale of Bideford's losses in the Great War and represents the wiping-out of most of a generation of young men in what was a relatively small town. "To the the glory of God and in grateful memory of the members of the (No. 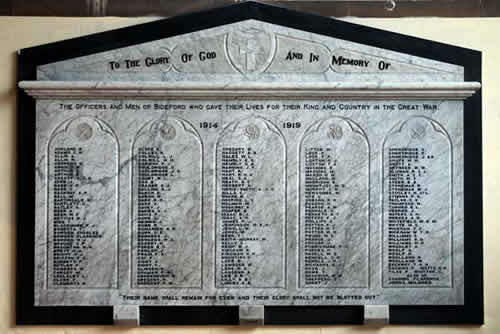 414) Bideford Company who made the supreme sacrifice during the Great War." Our thanks to Ian Arnold for explaining that the "No 414 Company" referred to membership of the Church Lad's Brigade - one of a number of diocesan battalions which provided the young men of a parish with their first contact with military life in the early 1900s.. Believed to be Edmond Potter, son of George and Jane Potter who was born in the December Quarter of 1876. 315368 Private Frederick Potter originally of the 1st/5th Battalion, the Devonshire Regiment, transferred to "D" Coy, the Wiltshire Regiment as 203124. Son of George and Mary Potter of Meddon Street, Bideford; husband of Lily Broderick Cornish (formerly Potter) of 25 Victoria Grove, Bideford.. Born in Bideford 18 December 1877. Died at Passchendale 31 July 1917 aged 39. 15194 Private Studley John Shute of the 10th (Service) Battalion, the Devonshire Regiment. Son of Thomas and Mary Shute of Northam. Born in Northam in 1894 but grew up in Bideford. Died 5 May 1917 aged 23. 8110 Private William Thomas Smalldon of the 1st Battalion, the devonshire Regiment. Son of Thomas and Grace Smalldon. Born in Bideford in 1891. Died 14 January 1915 aged 24. 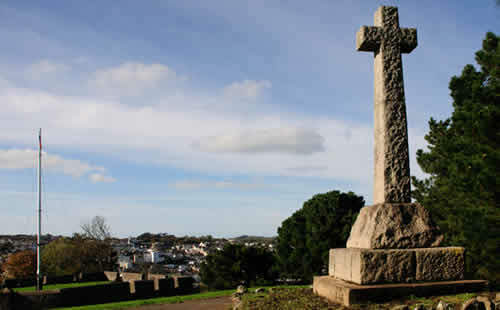 Bideford's town War Memorial on Churchill Fort sited for its commanding view of the town and high visibility from most of Bideford. The land on which the Memorial stands forms part of the actual memorial and is known as The Peace Park.